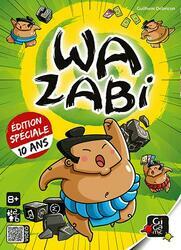 For its 10th anniversary version, sumo players are coming to Wazabi to give it a more acidic look. Offering a visual alternative to the original box, the two versions coexisting in the catalogue! Will you dare to enter the Dohyo (battle arena) to try to be the first to get rid of your dice?